There are 5 methods available in Muvi CMS to upload your videos to your website. Go to "Manage Content "--> "Video Library" in your CMS. Then select “From Computer” from the drop down menu. Note: When you upload your video, you can view its status on your screen. The status window will show how much video you have uploaded with the progress bar and upload information. Once the video is uploaded you can view it in Video Library. We provide a Server-To-Server Transfer method for video uploading. Note: This method only supports single video file upload. If you have several number of videos then you have to repeat the process for each video file. If you have a Dropbox account and uploaded all your videos there then, you can pull the videos to your Muvi CMS with the following steps. Login to your Dropbox account, go to “Files “and open your uploaded contents. You will find a “Share “menu at the right side while pointing to your video. Select “Share “and you will get a pop up window and copy the URL of your video as shown in the below screenshot. 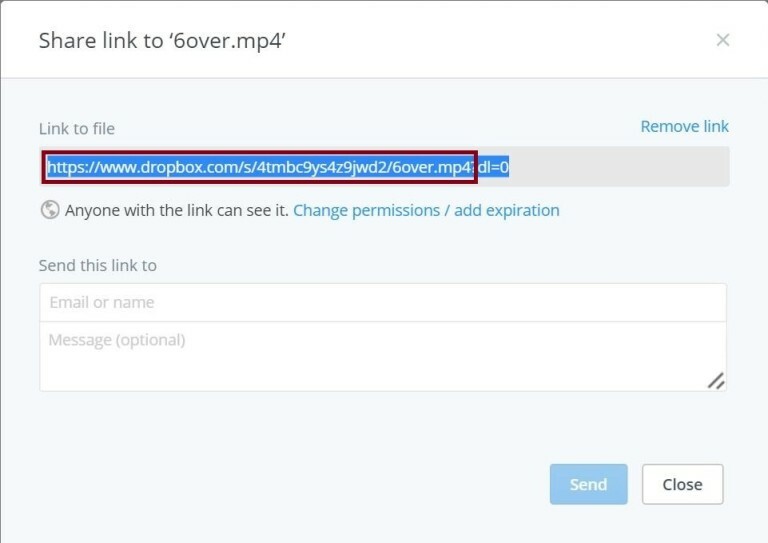 You need to paste the URL copied from Dropbox till the extension of the video format in the field “Path to the file on Dropbox”. Refer the above screenshot closely where the video format is .mp4 and you need to delete all other text after the video format (we have removed ‘‘? dl=0” in the URL). In this method, we use a traditional FTP client to upload videos to Muvi’s video library. Login to FTP account with the FTP account details provided in the CMS (See Below Screenshot). You can install FileZilla and then login to it using the FTP details provided. After connecting to this FTP account, you can upload your videos. Then, you need to click on “Sync to Video Library” on your video library page (See Below Screenshot). Then all your videos will be automatically uploaded to your "Video Library". Through this method you can upload bulk videos to your video library. Another advantage is that, you can connect to this account from multiple computers at the same time and upload your videos. For both Video and Audio file upload, you can use the same FTP account. Maximum video upload size is 63 GB (Single File). You can upload as many videos as you want. There is no limit for number of videos. If you want to upload video that is more than 63 GB (Single File) then you need to add a support ticket. Please upload only the video files to FTP server; do not upload sub-folders into the FTP; all files should be in the root directory of the FTP. Do not upload any other video file format except mov, flv, vob, mp4, m4v, mkv, avi, 3gp & mpg to FTP. Please play the video on the browser before uploading to FTP. We recommend you to maximize the uploading limit up to 10 videos at one time. Please wait 10-15 minutes for uploading next bunch of files. Once all files are successfully uploaded to the FTP server, go to "Manage Content" --> "Video Library" in your CMS and click on "Sync to Video Library" to start transferring the videos to your Video Library. If you have videos on Amazon S3 server, then you can share these videos with us. By using this method you can upload bulk videos to your Video Library. There are 2 methods to share your videos with us. 2 . This is a one time video sharing process. You need to share the videos with us like the above mentioned process, then you can remove the user and permission after transferring the videos to our server. This is a manual process. You need to add a support ticket to upload videos using S3 Sync. Do not upload any other video file format except mov, flv, vob, mp4, m4v, mkv, avi, 3gp & mpg. Once your video is uploaded, it will show in the “Video Library” page of your CMS.